Endodontists are dentists who have received additional training to provide the highest level of care for the soft inner tissue of the teeth called the dental pulp. The word "endodontic" comes from greek root words "endo" meaning inside and "odont" meaning tooth. All dentists receive training in endodontic therapy; however, some teeth can be difficult to treat and some pain can be difficult to diagnose. This is why your dentist has elected to refer you to an endodontic specialist, to ensure your tooth receives specialized care. In addition to four years of dental school, endodontists receive two or more years of advanced education and have practices that are focused on this type of treatment only. Endodontists work closely with your general dentist throughout the process to ensure seamless dental care for you. 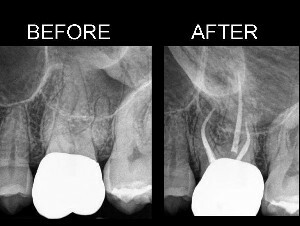 The narrow channels inside the roots are known as "root canals". Within the root canal is a unique soft tissue known as the dental pulp. The dental pulp contains tiny nerves that are commonly responsible for toothache pain. Occasionally, this tissue can become injured, and bacteria may contaminate the root canal spaces. The result is a painful infection that will not resolve until this tissue is removed. Root canal treatment is directed at the inside spaces of the tooth and is designed to eliminate infection, remove diseased tissue, and prevent re-contamination. A common misconception is that the roots of the tooth are removed during root canal treatment. This is not true, your tooth will remain intact and healthy after treatment, it is only the inside spaces that are treated. Priority number 1 is always to ensure your comfort. A small amount of local anesthetic will be given to gently numb the area around the tooth. The tooth is isolated with a sheet of latex called the "rubber dam" (nonlatex materials are also available). The rubber dam is placed around the tooth to keep all dental materials from getting into your mouth and ensure a clean and dry work environment. Once you are completely numb and the tooth is isolated, the diseased pulp is gently removed from the tooth, and the spaces are thoroughly cleaned and disinfected with various irrigants. After the inside of the tooth is clean and dry, a filling material is placed in the canals of the roots. 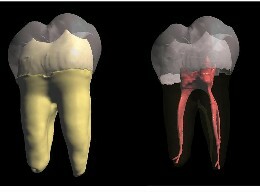 The image to the right is a simplified cartoon of a tooth -- the actual anatomy inside your tooth can be quite comlpex. In some circumstances the treatment can be completed in a single visit. However, most often, and in order to be very thorough and minimize the potential for future problems, we often complete treatment in more than one visit. We often do this so that we can place medicated dressings inside the tooth to maximize debridement and disinfection. Many dentists advertise 'single visit root canal treatment.' Take caution: speed does not improve quality. We put your dental health above all else, therefore, will take as much time as necessary to ensure the highest level of care. 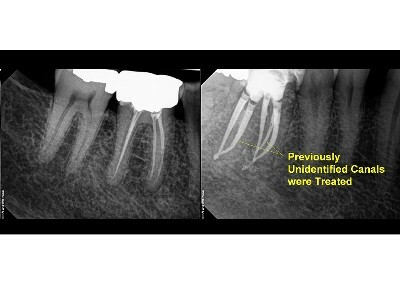 What happens after Endodontic Treatment? Root canal treatment only addresses the roots of the tooth, there is still additional dental work that needs to be done immediately after treatment is complete. Your general dentist will need to see you to 'restore' the tooth, which may include a filling, a crown, or both. It is very important that you see your general dentist right away to ensure a favorable long term outcome. There can be no guarantees for a successful result. 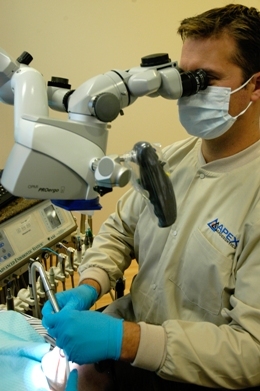 Endodontic therapy has a very high degree of success when done well, over 90%. The probability of long term success depends on a number of variables, and we will review your unique situation and discuss this with you prior to starting any treatment so that you can make an informed decision. If you have root canal treatment and develop problems with the tooth again later, you still have options. Dental trauma can be particulary problematic for young children when the tooth has not fully developed. 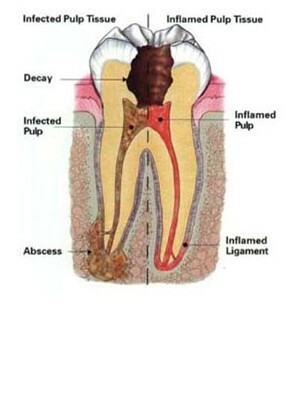 The pulp is the formative tissue for the tooth, therefore injury to the pulp may cause the tooth to stop growing. Prompt and appropriate attention is required to ensure the best possible outcome. Endodontic retreatment: Someone already did a root canal for me years ago. If the nerves are gone, how does it hurt and why do I need it redone? 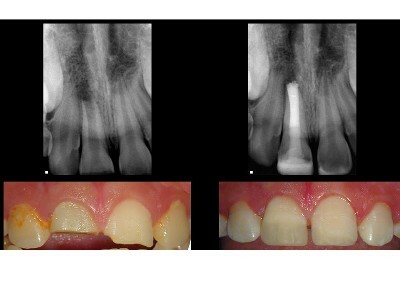 Occasionally a tooth that has undergone endodontic treatment fails to heal. Although your tooth may not have nerves inside, an infection at the root tip can cause inflammation and pain in the bone and periodontal ligament that surround the root tip. The reasons for persistent (refractory) pain vary. If you have pain in a tooth that has already undergone root canal therapy, it usually means that either some bacteria may have survived initial treatment, or new bacteria have found a way back in. How could bacteria survive the first treatment? The inside of the tooth is very complex. The canal systems are microscopic networks that can contain many branches, fins, or deltas that can be difficult to see or may be inaccessible. Without the aid of specialized equipment available today (e.g. microscopes and 3-D imaging), entire canal systems may have been overlooked. Even if all the main canals were located, bacterial films may have persisted in the irregular contours inside the tooth. Our armamentarium of techologically advanced instruments and materials, as well as our multi-visit approach are designed to address these areas. How could bacteria get back into my tooth? Bacteria are always present in your mouth no matter how often you brush and floss. Bacteria may be leaking back into the tooth around deteriorating fillings or crowns. Although rare, teeth may initially respond to root canal therapy but become painful or diseased many years later. When this happens, retreating the tooth by removing old materials and re-disinfecting the tooth, can frequently resolve the problem and help you keep the tooth.